I’m thinking of going to Leeds instead of Newcastle – any recommendations for places to stay? Areas to avoid? This whole trip planning thing is overwhleming! And the planner in me thinks I’m leaving things way late. Luckily train tickets still look pretty reasonable since I won’t actually be going anywhere until the 2nd week of May. And for a little fibery content, a project I’ve been working on (not very hard) for ages is finally starting to come together. 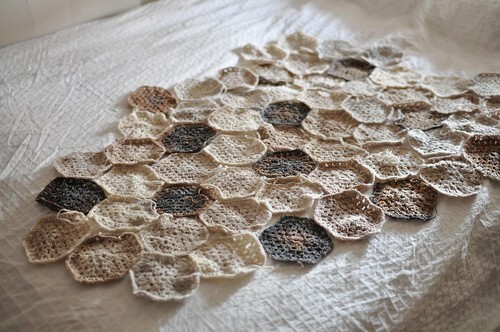 It’s a blanket, though this isn’t the final configuration at all – just needed to see how many more hexes I need! I like the blanket, it makes me think of fish scales. Have a great trip! Your blanket reminds me of a pinwheel like quilt my grandfather made. Lovely. I don’t know much about Leeds so can’t help there. But have you looked at buying a BritRail pass? http://www.visitbritainshop.com/canada/travel-transport/rail-tickets/product/britrail-gb-flexi-pass.html I didn’t buy this but they seem good value. I did buy the British Heritage pass and it was really worth the price. Hi, I live in the Leeds area, 42 the calls is lovely, there are also plenty of ‘chain’ hotels so I think there will be deals to be had. There’s lots to see in the city centre, but it’s also worth going a little farther afield maybe Harrogate (Victorian spa town complete with Turkish baths) or Haworth (if you’re keen on the Brontes) theres lots of really lovely places in the Yorkshire dales! Have a super trip! If you’re in Leeds then I’d reccommend going to York for a day, it’s only 20 minutes or so by train and can easily be accomplished in a day trip. Have a lovely visit! I hope I’m not too late to recommend Baa Ram Ewe in Leeds. A gorgeous yarn shop that specialises in British wool and British sheep breeds. :-) http://www.baaramewe.co.uk/ I’ve not been myself yet, but I’ve heard nothing but good about it. Hope you have a great remainder of your trip. I second Baa Ramm Ewe as an amazing knitting shop in Leeds. Anne Hanson and Cookie A visted a couple of months ago. 42 the Calls is a great hotel, though plenty of other hotels to choose from that may be more reasonably priced. Plenty of good restaurants in Leeds too. Armley Mill Museum and Thwaite Mill could be worth a trip for some textile heritage. Let me know if you have any specific questions, Leeds born and bred for 30 years! If you’re a mystery reader, try any of Stuart Pawson’s mysteries set in the Leeds area. He makes frequent reference to the days of the woollen mills, including some of their negative consequences. Have a great trip. Come to Newcastle and visit The Knit Studio! A yarn shop with a difference, located in a 13th Century Dominican Friary building in the heart of the city. We would love to meet you! Leeds is great and close enough to York for a day trip. York is a must-see! Leeds is fun because it is a bigger city with a lot more to do. They also have these beautiful indoor Victorian malls.